The scientific and economic significance of plant senescence means that much effort has been made to understand the processes involved and to devise means of manipulating them agriculturally. During the past few years there has been considerable progress in this regard, especially in the molecular, genetic and genomic aspects. Senescence has a tremendous impact on agriculture. For example, leaf senescence limits crop yield and biomass production, and contributes substantially to postharvest loss in vegetable and ornamental crops during transportation, storage and on shelves. In addition, proteins, antioxidants and other nutritional compounds are degraded during senescence. Senescing tissues also become more susceptible to pathogen infection, and some of the pathogens may produce toxins, rendering food unsafe. Mitotic senescence may also determine sizes of leaves, fruits and whole plants. 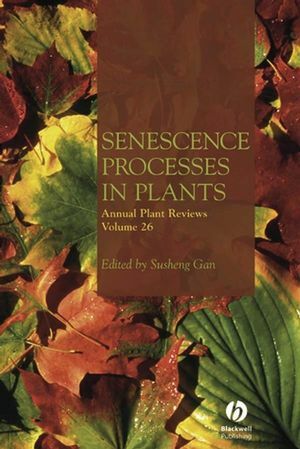 This volume summarizes recent progresses in the physiology, biochemistry, cell biology, molecular biology, genomics, proteomics, and biotechnology of plant senescence. Beginning with a chapter on senescence-related terminology and our current knowledge of mitotic senescence in plants (a less well-studied area), the book focuses on post-mitotic senescence, and includes chapters addressing the senescence of leaves, flowers and fruits. Later chapters examine the development of various new biotechnologies for manipulating the senescence processes of fruit and leaves, some of which are approaching commercialization. The book is directed at researchers and professionals in plant molecular genetics, physiology and biochemistry. Dr Susheng Gan is at the Department of Horticulture, Cornell University, Ithaca, New York. 1. Mitotic senescence in plants. Dr Susheng Gan, Department of Horticulture, Cornell University, Ithaca, NY 14853, USA. 2. Chlorophyll catabolism and leaf coloration. Dr Stefan Hörtensteiner, Institute of Plant Sciences, University of Bern, Altenbergrain 21, CH-3013 Bern, Switzerland; and. Dr David W. Lee, Department of Biological Sciences, Florida International University, Miami FL 33199, USA. 3. Membrane dynamics and regulation of subcellular changes during senescence. Marianne Hopkins, Linda McNamara, Catherine Taylor, Tzann-Wei Wang and Dr John Thompson, Department of Biology, University of Waterloo, Waterloo, Ontario N2L 3G1, Canada. 4. Oxidative stress and leaf senescence. Dr Ulrike Zentgraf, ZMBP, General Genetics, University of Tuebingen, Auf der Morgenstelle 28, 72076 Tuebingen, Germany. 5. Nutrient remobilization during leaf senescence. Dr Andreas M. Fischer, Department of Plant Sciences, 210 AgBioScience Facility, Montana State University, Bozeman, MT 59717, USA. 6. Environmental regulation of leaf senescence. Dr Amnon Lers, Department of Postharvest Science of Fresh Produce, Agricultural Research Organization, The Volcani Center, P.O.Box 6, Bet Dagan 50250, Israel. 7. Developmental and hormonal control of leaf senescence. Jos H. M. Schippers, Molecular Biology of Plants, Groningen Biomolecular Sciences and Biotechnology Institute, University of Groningen, Kerklaan 30, 9751 NN, Haren, The Netherlands;. Hai-Chun Jing, Wheat Pathogenesis Programme, Plant-Pathogen Interactions Division, Rothamsted Research, Harpenden AL5 2JQ, UK; and. Jacques Hille and Dr Paul Dijkwel, Molecular Biology of Plants, Groningen Biomolecular Sciences and Biotechnology Institute, University of Groningen, Kerklaan 30, 9751 NN, Haren, The Netherlands. 8. The genetic control of senescence revealed by mapping quantitative trait loci. Dr Helen J. Ougham, Dr Ian Armstead and Dr Catherine Howarth, Plant Genetics & Breeding Department, Institute of Grassland & Environmental Research, Plas Gogerddan, Aberystwyth, Ceredigion SY23 3EB, Wales, UK;. Dr Isaac Galyuon, Department of Molecular Biology and Biotechnology, School of Biological Sciences, University of Cape Coast, Cape Coast, Ghana; and. Dr Iain Donnison and Professor Howard Thomas, Plant Genetics & Breeding Department, Institute of Grassland & Environmental Research, Plas Gogerddan, Aberystwyth, Ceredigion SY23 3EB, Wales, UK. 9. Genomics and proteomics of leaf senescence. Dr Marie-Jeanne Carp and Dr Shimon Gepstein, Department of Biology, Technion - Israel Institute of Technology, Haifa, 32000, Israel. 10. Molecular regulation of leaf senescence. Dr Hyo Jung Kim, Division of Molecular Life Sciences, Pohang University of Science and Technology, Pohang, Kyungbuk, 790-784, South Korea;. Dr Pyung Ok Lim, Department of Science Education, Cheju National University, Cheju, 690-756, South Korea; and. Dr Hong-Gil Nam, Division of Molecular Life Sciences, Pohang University of Science and Technology, Pohang, Kyungbuk, 790-784, South Korea. Professor Michael S. Reid and Dr Jen-Chih Chen, Department of Plant Sciences, University of California, One Shields Drive, Davis, CA 95616, USA. 12. Fruit ripening and its manipulation. Dr James Giovannoni, USDA-ARS Plant, Soil and Nutrition Lab and Boyce Thompson Institute for Plant Research, Cornell University Campus, Tower Road., Ithaca, NY 14853, USA. 13. Genetic manipulation of leaf senescence.